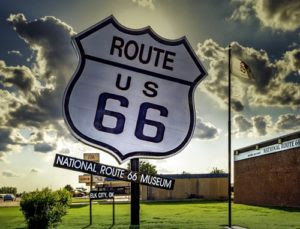 The National Trust for Historic Preservation on Tuesday included Route 66 among its annual 11 Most Endangered Historic Places list and urged Congress to name it as a national historic trail. It was the second time Route 66 made the National Trust’s most-endangered list. A smaller part of the Mother Road made the list in 2012. For more than 30 years, the National Trust has released its annual most-endangered list. The nonprofit organization notes of the more than 300 places listed, just 5 percent have been lost. Known as America’s “Mother Road,” Route 66 is an internationally significant symbol of our nation’s romance with the open road. While Congress has taken important steps to designate Route 66 a permanent National Historic Trail, which would bring national recognition and economic development to the route’s historic sites, legislation must be passed by the U.S. Senate and signed by the president before the end of 2018. Otherwise, a vital preservation opportunity may be lost. The National Trust urged readers to sign a petition to support the historic-trail legislation. A big impetus behind the bill is the impending loss of the Route 66 Corridor Preservation Program, which is scheduled to expire in late 2019. The U.S. House of Representatives a few weeks ago passed the bill by a voice vote. The measure is being considered by the Senate. If enacted, Route 66 would be the 20th historic trail in the United States and the second that traces its origins to the 20th century. The other 20th-century trail is the 54-mile Selma to Montgomery National Historic Trail. More about the benefits of a national historic trail may be read here. Mary and Eliza Freeman Houses, Bridgeport, Connecticut.